Got plenty of rain and by Wednesday White Top Laurel (WTL) was running high, with more rains on Wed. and Thurs., so by Friday the creek was +24″, assuring that there would still be plenty of flow even after the rains had stopped for a Saturday run. Bill H. c-1, John Van L. k-1 and myself k-1 settled on going to WTL and met up in Damacus Va. down near the take-out on Saturday morning. WTL was running about +8″ on the local Iron bridge gauge and the usgs was showing 1850cfs on S. Fork Holston at Damascus which usually correlates pretty good as WTL is normally the key contributor. This was an excellent flow. We set our shuttle from the Iron Bridge take-out and just as we where leaving a couple showed up with boats, looking about like they wanted to paddle but did’nt know the run. So we stopped and met Chad and Jennie both k-1. As it turns out they where wanting to do WTL but where new to the run and didn’t know much about it. After a little discussion we offer to have them join us, which they quickly accepted. It was turning to to a nice day, a bit cool but decent, sunny to overcast through the day, with a spot of showers just in the last mile. So we all head to the top put in, five of us. At the top we quickly put our gear together and launched. Jennie was a bit worried by a video she had seen a couple of months earlier put out by some of the local paddlers of a beat down in a hole at one of the ledges. I assured her I knew the individuals and the spot and it would not be a problem to avoid, nor was the level as extreme as the video. 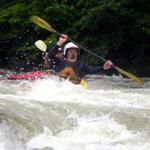 We let Chad and Jennie know early on that the two most significant rapids we would scout and both could be portaged easily, settling any concerns. 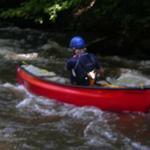 Both Chad and Jennie quickly proved to be good paddlers and Bill, John and myself all had experienced on this run. Well WTL starts out fairly quickly with some nice boogie and creeky fast water. Tight and narrow at the top with plenty of features to work. One of the biggest things to be careful of on this run are the many railroad trestles still used for the Virgina Creeper trail which runs on the old narrow gauge rail-bed and winds back and forth across the creek on these trestles, now used as foot bridges. Problem with these trestles is most are wooden built with timber construction and are set at angles to the flow, due to which they both catch strainers/deadfall wood and pose a serious broach pin hazard. So where to and how to approach and run these, we made Chad and Jennie aware of early. In addition many of these trestles have multiple steel cables upstream swung low across the creek and secured to rock walls to hold the bridges against floods. One must be very mindful of these cable as in places they are chest to head high above the water and getting tangle or knocked over (and possibly knocked out) just upstream of a trestle is a serious hazard. Down a mile or so we came to a rapid called “The Slot”, a class 4+ with a narly entrance drop on far right just upstream with plenty of flip and trip features into the swirling short pool below and then a weave down to the “slot drop proper” below with a hammering run through a top hole across currents and down and rock slot or trough into a boiling pool below. While a fair amount of flow goes far river right of the slot, that’s a place to avoid as its a pinning sieve. Far left is doable but a rough bump and grind with some nasty flow features into and through a tight bend cut into the left wall with two drops (not very clean). Jennie decided to walk along with Bill and John. Chad was game for a go and did great run after after looking over the run reviewing the line options, he ran it nice and clean. Below the slot the main chute out of the pool on river right had a bit of a vexious small tree into to it to the point we all opted to work the bang down on far left and enter the long non-stop run below, steep with almost continuous boulders, drops, pour-overs, holes, diagonal, etc., a real creeking thrill. Everyone did fine, catching eddies, chutes, boofing ledges and holes down through the bend well below to the next long pool. This is an exillerating section. From here we just kept having more and more fun working the ledges, chutes, etc. 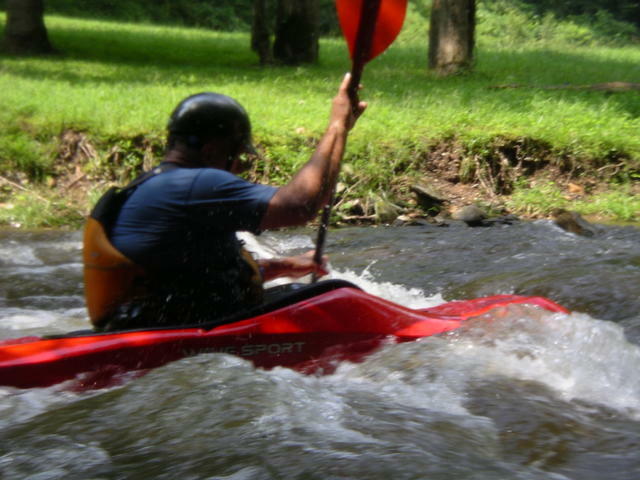 in the fast creeky water for several miles down to Taylor Valley area. Just above Taylor Valley we enter a bend with a couple of down trees to be worked around and then one of the craggiest rock rapids and ledges on the run. 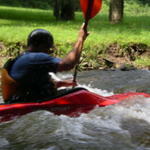 This one is just loaded with boiling water and rocks below, so its keep paddling, push your line, and brace, brace, brace. Swims or flips here can be ugly as its really craggy, rough rock mixed in the boiling chutes and lines. I ran on down first and set up for safety boat below as you want to get anyone swimming here out quick. Everyone did ok, except Jennie flipped in the meat of the drops, but fortunately tucked well and rolled, then flipped just below and rolled again, undamaged. On down into the settlement of Taylor Valley below here we took out at the bridge and took a break to eat a bite. Then after surfing the great little wave at the bridge we where off again into a nice fun section which has some excellent fall/drop with nice steep creeky runs though boulders and ledges and many features. Along the way several big ledge drops are found with multiple routes, holes, chutes and boofs. Everyone was having a great time and by this time Jennie and Chad where loving the creek and already talking about coming back. After passing the put-in/take-out for the middle WTL, we worked the narrow stream below where the creek divides into about 3 routes, furthest down. From here we just plain had more fun playing the ledges, drops, boofs, holes and other features down to Big Rock Falls which in to past was rated a class 5 and is by most considered at least a 4+ primarily because of some features above, on, and below in certain places. Basically a falls area you want to be on line and upright at. We all walked down for a look, and to make sure Jennie and Chad got the choices of lines explained. Down at big rock I met up with some of the SRVCC boys, who where studying and wondering about where to run the falls, and quickly came over to ask me. After explaining the most fundamental line on river right to them, they went up and took their runs, giving our group a chance to watch from below. After their runs one of the group asked me about the old traditional line on river left and I obliged and ran over the line from the bridge above down with him, as this one need some set up from well above to hit. 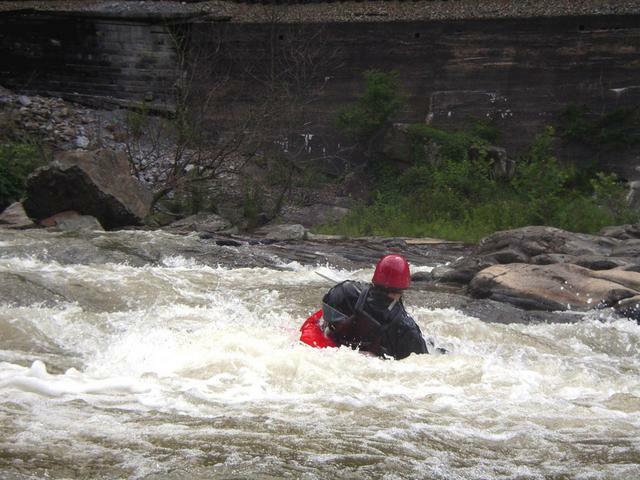 Well I went on upstream with the guy, and I ran on down the right line followed by Chad, then sat in to pool below to get picture of the left line run and be ready for safety. Well the guy ran probably the best left line I have ever seen, with the nicest boof. From Big Rock Falls we just enjoyed working more features packed into the remainder of this wonderful creek which from below Big Rock become a pretty significant flow with feeders coming in all the way down. On down after some nice ledges and rapids, we came to the rock wall along the road. Tucking in behind a big boulder on river right just as this part of the run starts, I told Chad and Jennie about the three hydraulic line holes coming up just below and the line options, and then led off, booking far left just above the first hole to catch a small tongue through. 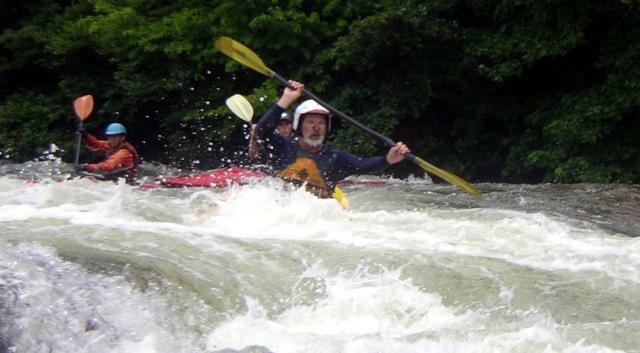 This first one is a nasty hole, that I once ended up in many years ago, in my open canoe along with two kayakers all at the same time, and I can testify its really sticky. From there I lead off down the left through the two holes below. 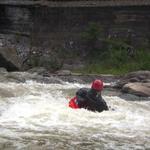 From the three holes its about a mile or so left with some nice boofs, ledges and rapids to the takeout at Iron Bridge. WTL is a creek where the fun just keeps coming. Well, it was a great run and WTL has two new fans with Jennie and Chad, joining the rest of us. Well we changed loaded up on the paddlin-ed van and I took everyone back to the put in. After exchanging contact information with Chad and Jennie, we said our goodbyes till the creek runs again, hopefully real soon. End of the day gauge was about +7″ on the Iron Bridge and 1600 cfs -usgs SFH at Damascus Great day, great time, fabulous run, great company. Ed, I would love to run this sometime! Let me know if you are headed that way. 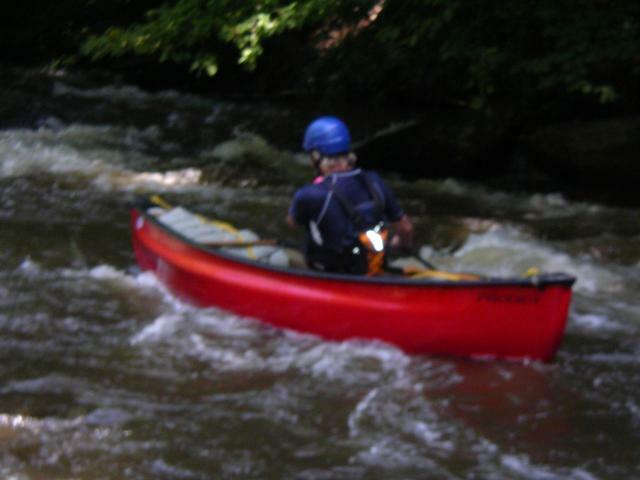 Will do Matthew, keep you in mind for the next run, enjoyed paddling with you last Sat. on the Noli. You would enjoy WTL, its a blast.